During the chilliest time of the year, Chai Lifeline is filled with radiant warmth because of the love of our Chanukah Angels. Chanukah Angels are friends and supporters who adopt a family with a child living with illness and brighten their holidays with gifts. Not only do the Chanukah Angels pile our office high with festively, hand-wrapped boxes, bags and bundles, but they go out of their way to fulfill the particular playful desires of these very vulnerable kids in desperate need of a little cheer. It’s hard to say who gets more out of the program: those whose wishes are fulfilled or those whose hearts are overjoyed by fulfilling them. The presents, though picked out with love and wrapped with such care, are more than toys, games, dolls, and electronics. Each is a symbol of love from a Chai Lifeline friend to a child who desperately needs things to smile about. In fact, for many Angels, the project becomes a family affair, with members of the sponsor family selecting and wrapping presents and making Chanukah cards for children they have never met. One family glued jewels all over each pink-wrapped gift so it would look like a treasure for the recipient, a little girl with lymphoma. 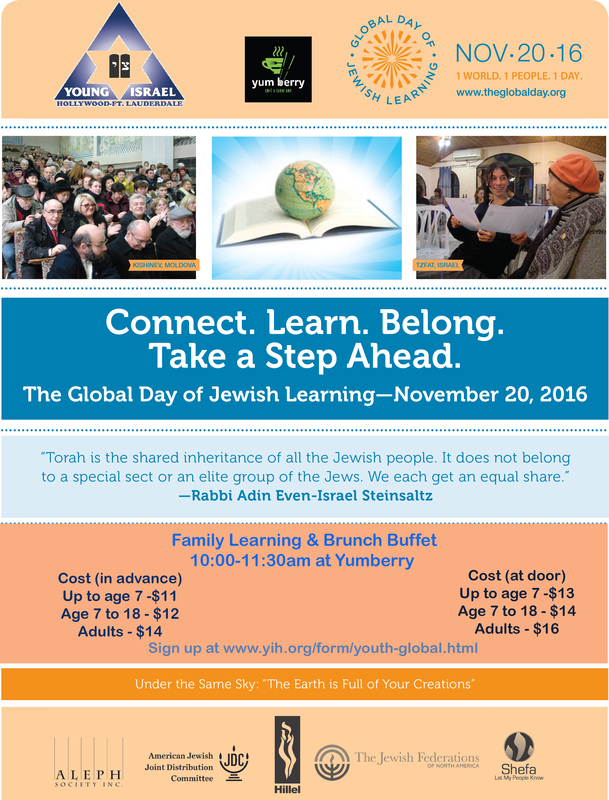 We invite Parents, Grandparents, Children & Grandchildren to join us at Yumberry for Family Learning & Brunch on November 20th - See flyer below for more details and click here to register in advance. Bnei Akiva of Hollywood is BACK!! Relaunch Shabbat is almost here!! 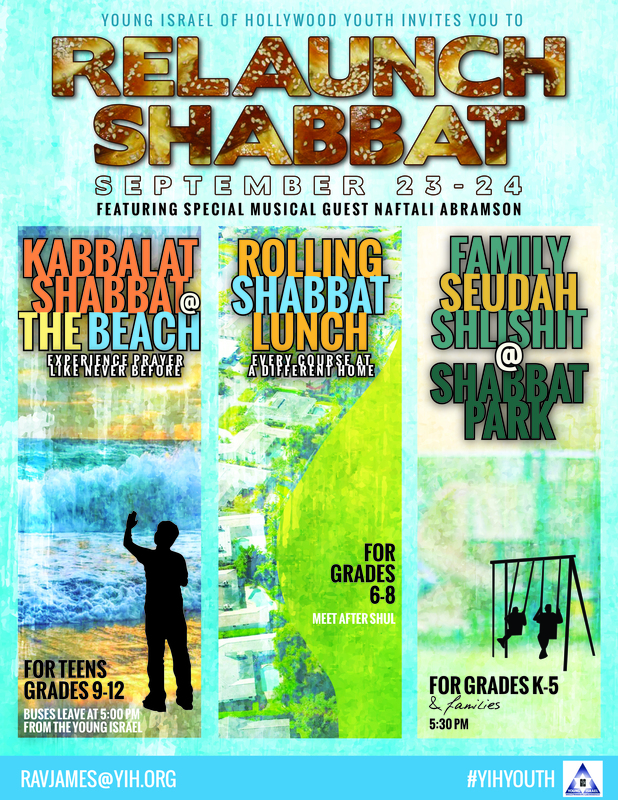 Teen Kabbalat Shabbat @ The Beach with Music by Naftali Abramson. The program is open to Grades 9-12. Meeting at YIH at 4:45 pm, buses leaving YIH promptly at 5pm and returning before Shabbat commences. Rolling Shabbat Lunch open to Grades 6-8 with delicious food, games, Divrei Torah and Zemirot. Leaving YIH after completion of Main Sanctuary Minyan. 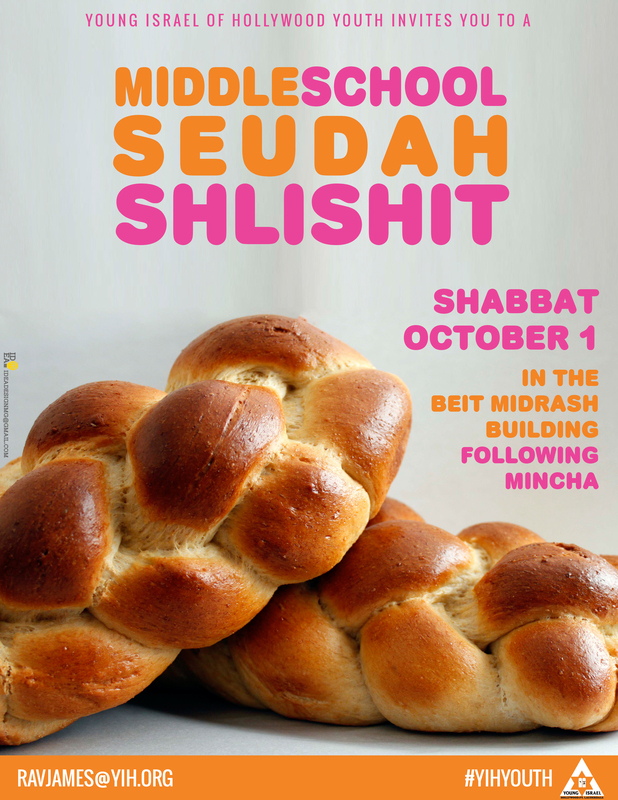 Seuda Shlishit in the Park open to Grades K-5 and their parents in the Shabbat Park with Slow Shira lead by Naftali Abramson at 5:30pm. Please bring blankets and/or chairs. Are you in 6th - 12th Grade? Do you want a say in what happens in your community? Join the YIH Youth Council today and have your say in the way the Youth Department runs!! Online reservations are now closed for today's Youth Kickoff event. If you did not reserve but would like to attend, we recommend the 6:30 or 7:00 PM start times. The start times are for Mini Golf only. We'll have other glow activities going on around the social hall, so please feel free to show up early and stay late! Please check in around 15 minutes before your scheduled start time. Since some of our time slots are full, people who do not check in before their scheduled time may lose their spot to a standby. If this happens, you will be able to play the next available time slot. It will be pretty dark in the social hall throughout this entire event. Please keep an eye on small children! Because of changes to our allotted space at the Club, there has been some confusion regarding Youth Programs on Rosh Hashanah and Yom Kippur. This message is intended to clear up the confusion. Please read it in its entirety, and feel free to reply with any questions you may still have. 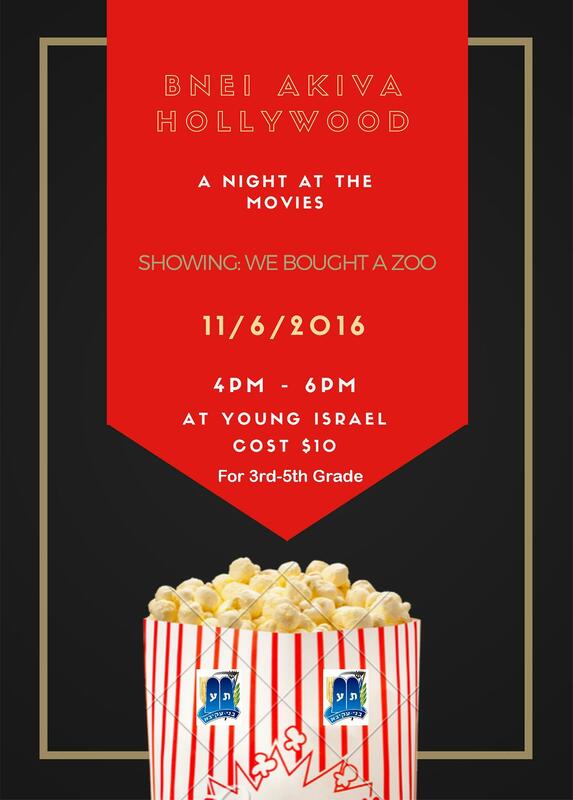 Grades 4 and up: No formal program; please purchase a seat if they are attending shul. Youth Leaders will walk children in Grades K-3 to the shul for Groups, and walk them back at the end. Call the shul office or click here to register. No food, small, toys, candy, etc. may be brought in. Just a quick reminder that if you reserve by noon on Wednesday, you save $5 per person on this event, so reserve your spot now! 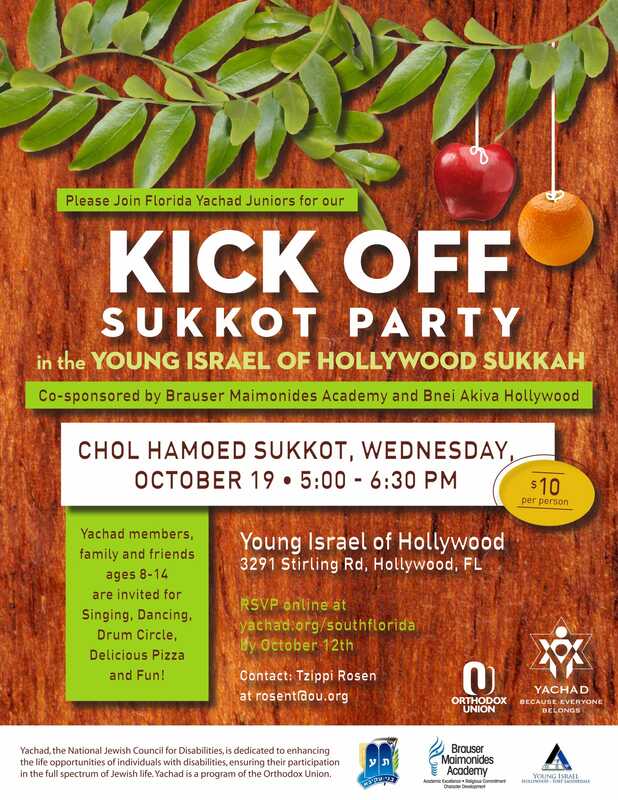 Don't miss this high flying Sukkot event! This event is fun for all ages and will take place Wednesday, Sep 30, starting at 5:00 PM. Cost: $10 with advance reservation; $15 per person at the door. ​We are in need of teen volunteers who can help with this event. Please reply to this email if interested. Just a quick reminder that if you reserve by noon today, you save $5 per person on this event, so click here to reserve your spot now! Although there is rain forecast for today, it is expected to clear up before tonight's event. We heard from several people who had trouble registering online for tonight's festivities. It seems that there was a problem with the online form, so we will not be charging the extra $5 for those who did not register. Limo Scavenger Hunt for grades 6-8 TOMORROW... almost sold out! Well, technically, the event is already sold out and two people are on a waiting list. But if we can get 8 more participants, we can add another limousine and accommodate everyone! So, if you are interested in attending one of our most popular middle school events of the year, send an email to Jason Segelbaum at segelbaumj@ncsy.org or call 305-772-0482. Details are in the flier below. 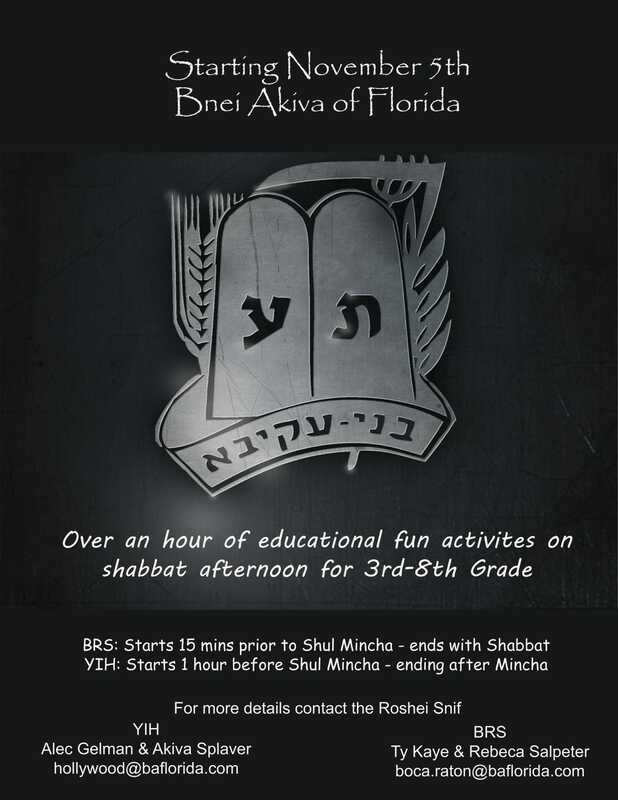 Bnei Akiva's kickoff event for grades 2-8 will take place upstairs at YIH, this Sunday at 9:30 AM. Details are in the flier below. See you there! Tonight's EMTZA NCSY event for grades 6-8 has been postponed to next Tuesday, November 24. See flyer below. Bashevkin LATKE Night has been changed from Monday, December 14 to Sunday, December 13. Click here for details and online registration. This Thursday evening will be a Youth Committee meeting. If you are interested in participating in the Youth Committee this year, please reply to this message and we will send you the details. An extra special kiddush after the Teen Minyan: More than the usual cholent and potato kugel; our Shabbat Mevarchim Kiddush features Lewis Niad's Famous Chicken and more, plus a special guest speaker. 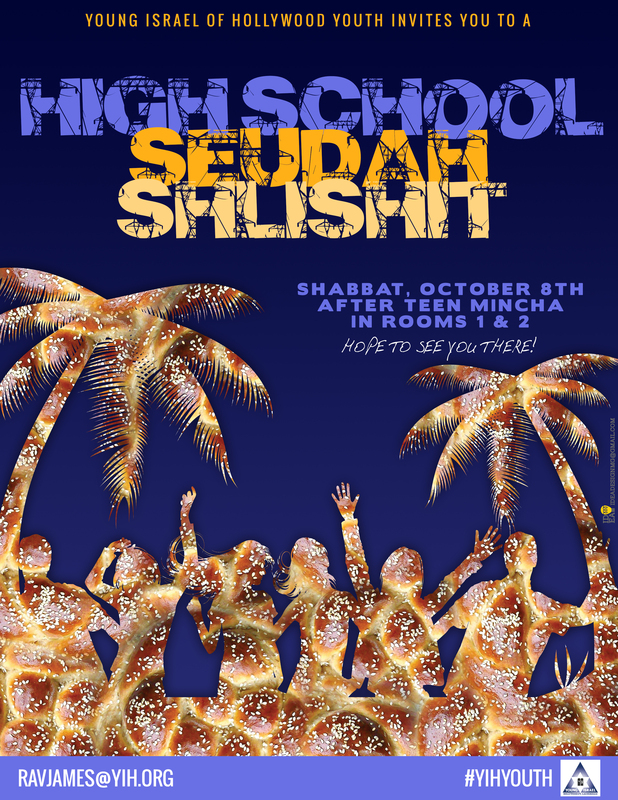 An expanded teen Seudah Shlishit after Teen Mincha: This will be held upstairs at YIH, and will feature a surprise guest speaker every month, presenting some of the coolest topics. This program is open to all teens. 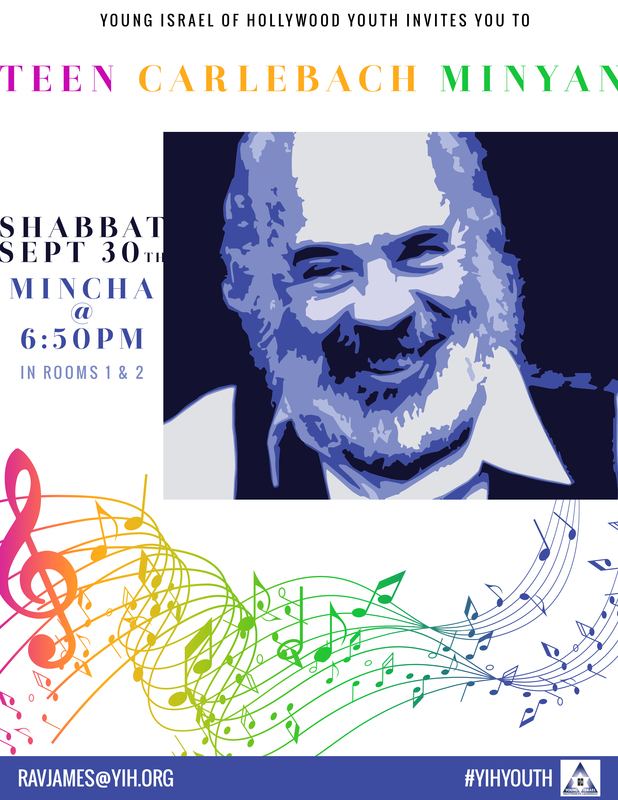 We hope to see you there this Shabbat! Grades 9-12 are invited to join us on the 4th night of Chanukah, Wednesday evening, December 9, 6:00 PM at YIH for "Fryin With Frier." In keeping with the Chanukah tradition of eating fried foods, we'll be exploring some of the most unexpectedly delicious foods you can put in a deep fryer. Pre-Registration for Bashevkin Latke Night is open, and the benefits of pre-registering are huge! We'll be giving away amazing prizes, including a hoverboard, video drone copters, and more. To learn all about Bashevkin Latke Night and register online, click here. Grades 9-12 are invited to join us tomorrow night, the 4th night of Chanukah, Wednesday, 6:00 PM at YIH for "Fryin With Frier." In keeping with the Chanukah tradition of eating fried foods, we'll be exploring some of the most unexpectedly delicious foods you can put in a deep fryer. YIH Youth LATKE Night this Sunday... Pre-register now! Click here to pre-register now and save! What is Bashevkin Latke Night? Bashevkin Latke Night is our annual Chanukah event that combines bingo, TV-style game shows, Chanukah treats, and amazing prizes, for an evening jampacked with action, excitement, and fun! All ages! This is a family event brought to you by the YIH youth department. Kids old enough to recognize a picture and mark it on a bingo board are ready for LATKE! Kids too old to love winning cash and prizes should stay home. But December 13 is a school night! It’s also the 8th night of Chanukah. Loosen up! Live dangerously! You won’t regret it! We promise! We’d love that! If the prize is donated by your company, we’ll give you a special plug when the prize is announced. Call Avi Frier at 954-483-3654 or reply to this email. Book an entire table of ten and get exclusive up-front reserved seating. No need to arrive early and claim the best spot---it will already be waiting for you! Do it now... Pre-registration closes at 12:00 PM on Sunday! Click here to pre-register now and take advantage of these benefits and more! YIH Teen Shabbat Dinner this Friday night - Register now! All YIH high school students are invited to join us this Friday night, January 1, for Shabbat dinner, a fun program with Elie & Naomi, and a special guest speaker, Rabbi Russ Shulkes. Rabbi Shulkes grew up in our shul and is now the Executive Director of Hillel of Georgia, which serves the Jewish populations on ten college campuses across the State of Georgia. Mincha this week is at 5:30; dinner following Maariv. The cost is $18 per person if you register in advance; $25 for walk-ins (walk-ins will be invoiced after Shabbat). Due to an unexpected number of teens away this weekend, we must postpone our YIH Teen Shabbat Dinner. We're working on the new date which, because of finals and winter break in January, will be in February or March. If you already reserved: your payment will be applied to the new date; if you are unable to attend, you will be refunded. The NCSY Wacky Olympics scheduled for tomorrow night 1/19/2016 has been cancelled. 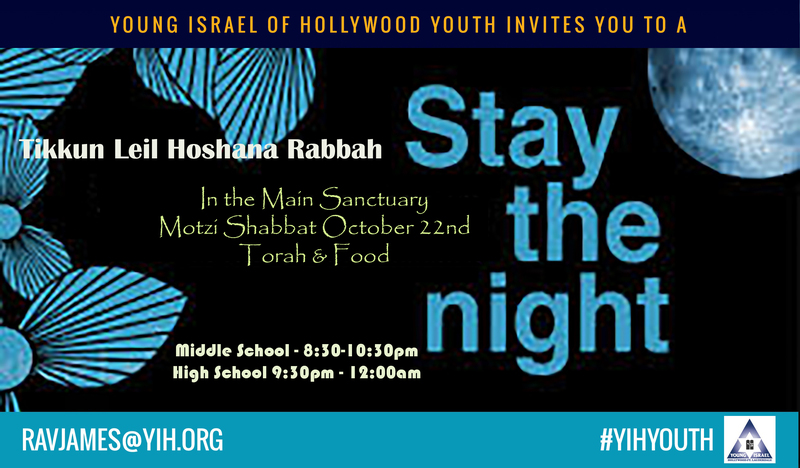 YIH Teen Dinner and Youth Lunch This Shabbat - Register now! This Shabbat, March 4-5, we will have a Teen Shabbat Dinner for grades 9-12, and a Youth Shabbat for grades K-5. The Teen Shabbat dinner will feature guest speaker Rav Ronen of Bnei Akiva, a fun activity with Elie & Naomi, and more. 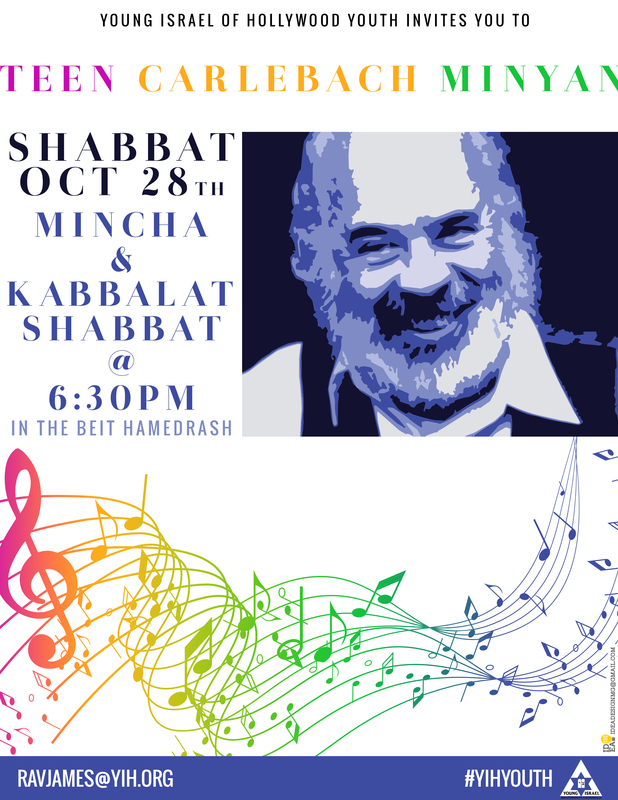 Come for Mincha/Kabbalat Shabbat at 6:15 and stay for dinner. Program ends 10:00 PM. The Youth Shabbat Lunch will feature a delicious lunch with fun activities by Sonia, Avi, and your favorite group leaders. Stay after shul; pickup is at 2:30 PM. The cost for each event is $18 per person with advance reservation; $25 without. As we prepare for Purim, big plans are in the works for our annual Mesibat Meir Purim Celebration. As in years past, the celebration is dedicated in loving memory of Michael Zablotsky, the son of Charles and Lily Zablotsky, who was tragically taken from us at age 20, just days before Purim 5755/1995. We are seeking sponsors for this event; as this is the only time of year that the Youth Department does an open solicitation of funds, I hope we can count on you to help make Purim a wonderful experience for the children of our community. Every year, our children have loads of fun at the Mesibat Meir Pre-Purim Carnival, but the greatest excitement is always found in the answer to the annual question: What mind-blowing surprise will Avi have for us on Purim night after Megillah reading? I can guarantee you that this year, with your help, no one will be disappointed. It's gonna ROCK! P.S. If you prefer not to use our online form to participate, feel free to reply to this email with your pledge amount and I will have the shul office bill your account. Thank you! There is still some room at tonight's Teen Shabbat Dinner (grades 9-12) and tomorrow's Youth Shabbat Lunch (grades K-5). We'd love to have you there even if you did not reserve in advance (the shul office will invoice non-registered participants after Shabbat). Help us make Purim even more festive! Are you on the list of YIH Youth Purim Sponsors? Thank you for the wonderful response we've had so far to our annual Mesibat Meir Purim Celebration. The current list of sponsors is below. If you'd like to be added to this list, please click here or reply to this email and let me know. As in years past, the celebration is dedicated in loving memory of Michael Zablotsky, the son of Charles and Lily Zablotsky, who was tragically taken from us at age 20, just days before Purim 5755/1995. In addition to the Purim fun your children have come to expect each year, we have listened to your feedback from previous years and will add a Megillah program for young children in a separate room during the main shul Megillah reading. This will make Purim night so much more meaningful for those children, and will help us to increase the decorum (and speed) of the main shul Megillah reading. We are still seeking sponsors for this event; as this is the only time of year that the Youth Department does an open solicitation of funds, I hope we can count on you to help make Purim a wonderful experience for the children of our community. Purim is almost here, and the celebration starts this Sunday! Below is a complete schedule of our Youth Purim Festivities, including a brand new addition to Megillah night, exclusively for younger children. You will get wet! Leave costumes at home! Teen Volunteers needed. We're getting started at 9:00 AM and will have Community Service letters on hand to give you when you check out. NEW FOR 2016/5776: Special Purim program during Megillah reading for children ages 3-7, featuring a funny dramatic presentation of the Purim story. Drop off upstairs in rooms 1-2 at 8:00 PM; pick up after Megillah reading. If your children run around and make noise in the shul during Megillah reading, preventing others from fulfilling the mitzvah of hearing every word of the Megillah, you will be asked to take them out of the room, so please take advantage of this program. Of course, the above does not apply to the noise we make when Haman's name is read, at which time loud obnoxious noise is encouraged! In addition to the opportunity to help out at the carnival and Purim night celebration, we are looking for 9 teens and/or adults to participate in the children's Purim play mentioned above. Speak to Avi Frier (or reply to this email) if you're interested. We look forward to seeing our 6th-8th graders at tonight's Oneg Shabbat. Despite a few drops of rain earlier this morning, the Purim Carnival is ON. We hope to see you there! If it does rain later today, there is a higher probability that the rain will come after 12:00. So, we will open the outdoor rides early (around 10:15 AM). Feel free to come early to enjoy the outdoor attractions, and you can move inside for the Bnei Akiva Shuk Purim if it starts to rain later. Special Purim program for younger children - We need your help! We are looking for some volunteer actors to help make this special program even more meaningful. Prior acting experience not necessary! Adults, teens, and preteens welcome. Reply to this email for details. Volunteers are needed for our YIH Youth Year-End Event, Family Fun Day & BBQ, May 30 at TY Park. There will be a meeting tomorrow night (Tuesday 5/3) at 8:30 PM. This will be our only meeting, as all future follow-up with volunteers will take place via email. If you are interested in attending the meeting, please reply to this email. Register now for YIH Youth Family Fun Day! Join us Monday, May 30 (Memorial Day) for YIH Youth Family Fun Day at TY Park! If you cannot view the flier below, please click here. We have a great lineup of classes for Middle School and High School students on Shavuot night (this coming Saturday night, June 11). PLEASE NOTE: The high school program will run all night, but middle schoolers must be picked up by 2:40 AM, unless they are with a parent or responsible adult in one of the shul's learning programs for the remainder of the night . 12:50-1:30am How Did They Know? This year's kickoff event will be a Glow-In-The-Dark Pizza Party, featuring some of the coolest luminescent activities you've ever seen in the YIH Social Hall! It all happens Monday, September 7, starting at 4:30 PM. The event is free with advance reservations; $5 per person at the door. Don't miss our most cosmic Youth Kickoff Event ever! This event is fun for all ages and will take place Monday, Sep 7, starting at 4:30 PM. Cost: FREE with advance reservation; $5 per person at the door. HIGH SCHOOL STUDENTS: Join us at the home of Miriam Baitner, 5821 Quiet Oak Lane (Arapahoe). This is our first Oneg Shabbat of the year--help make it a great one! Grades 6-8: Join us upstairs in rooms 1 and 2 for fun activities, pizza, ice cream, a meaningful pre-Selichot program, and abbreviated Selichot. Sunday, Oct 12: Teen Sukkah Tailgate BBQ at Sun Life Stadium. Get your own tickets to see the Dolphins play the Packers, and join us before the game for a tailgate of epic proportions! Monday, Oct 13, 5pm: Annual Simchat Beit HaShoeva. You will get wet. The details below apply to both days of Rosh Hashana, at the shul and at the club. Please drop off children at groups. Children will receive a wristband and will not be permitted to leave unless picked up by an adult. Lunch will be provided. Please advise staff of any allergies. Lunch includes: bagel or sliced bread with choice of cream cheese, butter, strawberry or raspberry jelly; baby carrots; fruit cup; chips; cookies. Families that did not register in advance will be invoiced by the shul office. Children who are not in groups must be directly supervised by a parent. The Kol Ha’Nearim aliyah each Simchat Torah is a moving and poignant moment. As the children crowd onto the Bimah, they look up to the chupah above them and see their names. This year we are once again planning special experiences for our children which will further enhance everyone's enjoyment of this special day. To have your children’s names inscribed on the Kol Ha’Nearim Chupah, please click here to access the inscription form. WE NEED YOUR SUKKAH! 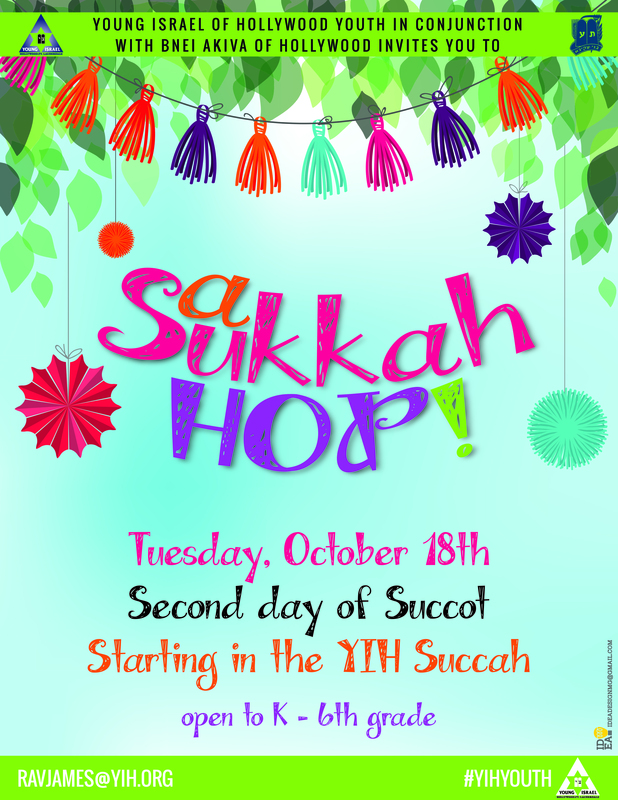 Help us pull of another amazing Sukkah Hop! As always, the Hop runs as a progressive meal: Kiddush and Hamotzi at the shul; appetizers at the first sukkah; main course at the second sukkah; dessert and pickup at the Eisenmann sukkah. Please contact Avi Frier at 954-483-3654 or avi@yihyouth.com to volunteer your sukkah for a course for your child’s age group. The YIH Youth Department invites you to join us next Sunday, October 12, for a Sukkot Tailgate Party at Sun Life Stadium, when the Dolphins take on the Green Bay Packers. Festivities begin at 11AM; Game time: 1PM. YIH Teens and YIH families. Teens are welcome to join us by themselves; younger children must be accompanied by a parent or responsible adult. Will there be a Sukkah? Of course! And we thank Avromi and Beth Friedman for making it possible. Where should we go when we get to Sun Life? We'll let you know the exact location on Sunday morning. It will be posted on Twitter and on our Facebook page, and will also be emailed to the people who RSVP. Payment as detailed above, a football to throw around, tickets for the game, and your Dolphins Spirit! We'll take care of the rest! Easy! Send an email to avi "at" yihyouth.com and let us know how many people you're bringing. Will YIH be arranging tickets to the game? No, that part is up to you. But we can assure you that wherever you get your tickets, and wherever you may be sitting, you will NOT go to your seats hungry. Burgers, hot dogs, wings, salads, pickles, drinks, chips, dessert, etc. Standard BBQ tailgate fare. There will be water for netilat yadayim and benchers for brikat hamazon. If you have any special dietary needs, please include your request when you RSVP. What if I have additional questions that weren't answered in this email? Send an email to avi "at" yihyouth.com with your question. We'll do our best to answer. Click here to download a printable flier detailing all of these activities. On Shabbat Chol HaMoed, October 11, Grades K-6 are invited to join us after the Main Minyan Kiddush for the annual Great Sukkah Hop. The Great Sukkah Hop is a progressive meal, starting with Kiddush & Hamotzi in the shul Sukkah, followed by appetizers and main courses at the Sukkahs on the chart below, and ending with dessert at the Eisenmann Sukkah. All groups are accompanied by teen group leaders from the YIH Youth Department. Please pick up your children promptly at the conclusion of The Hop. Please click here for the full details about this event. Join us at the shul at 5:00 PM for the Annual YIH Youth Simchat Beit HaShoeva. You will get wet. $10 admission per person includes water attractions and pizza. On Thursday, October 16 (Shemini Atzeret) at 4:00 PM, bring your mini ones for Mini Hakafot in the Social Hall. 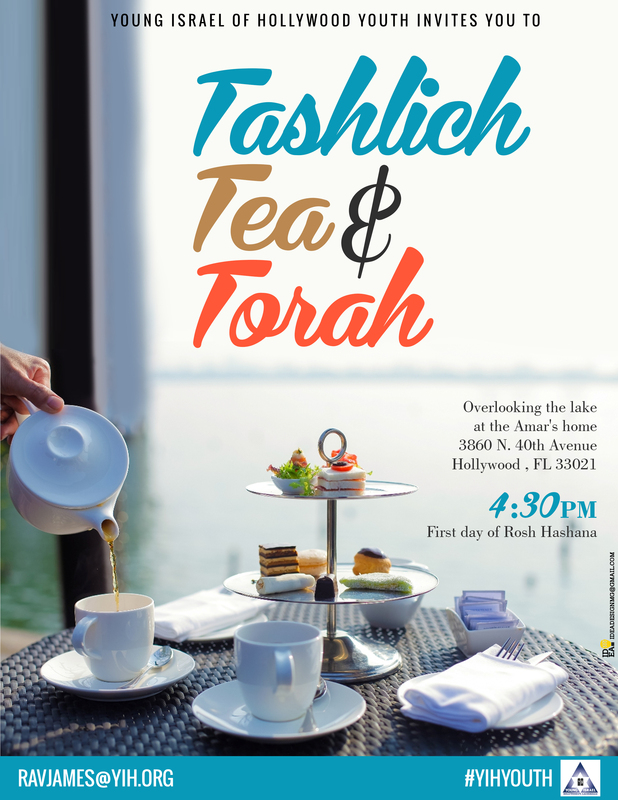 We’ll sing and dance with the Torahs, give out tasty treats, and have a great time. It’s just like Simchat Torah, only without staying up past our bedtimes! All YIH 9th-12th graders are invited to the Frier home (4031 N. 41 Ct.) for a BBQ after shul on Simchat Torah. See you there! Mon, Nov 3, 5:30-7:30pm: Anti-Semitism on College Campuses: Are You Prepared? a workshop for High School Seniors. 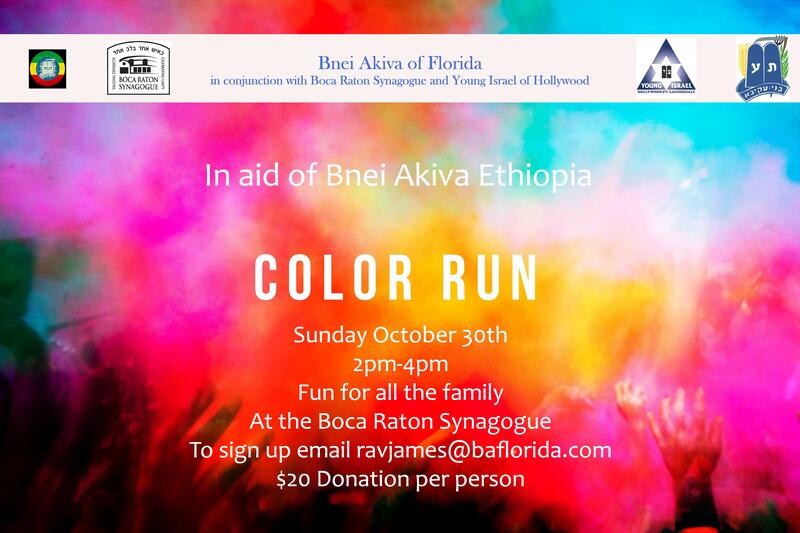 Presented by Broward Jewish Federation. Click here for info. Saturday Night, December 13: Teen Panoply Challenge. Click here for info. January 15-23: Winter Break Adventures winter day camp program for kids in K-6. Details and registration info coming soon. Join us TODAY at the shul at 5:00 PM for the Annual YIH Youth Simchat Beit HaShoeva. You will get wet anyway, so this event will happen RAIN OR SHINE. $10 admission per person includes water attractions and pizza. and will be emailed as soon as they are available. Sunday, November 2, 4-6pm: Bnei Akiva and the Wonderful, Amazing, Excellent, Very Good Day, a fun event for grades 3-6 at the Bayit. We are excited to announce a brand new incentive program exclusively for middle schoolers who attend, participate, and assist in leadership roles in the YIH Youth Minyan. The details of this exciting program will be revealed at the Youth Minyan on Shabbat, November 22. Don't miss it! This Sunday's Jr. NCSY Limousine Scavenger Hunt has been postponed. A new date will be announced soon. Shabbat, Nov. 22: The launch of the Youth Minyan USA Incentive Program for middle schoolers who participate in the Youth Minyan. Shabbat, Nov 22: Shabbat Lunch for 9th Graders at the Weinstock home. RSVP to Rabbi Weinstock. Saturday Night, December 13: Teen Panoply Challenge. Have you put together your team yet? Competition will be fierce. Click here to register! January 15-23: Winter Break Adventures winter day camp program for kids in K-6. Click here for details and registration info. 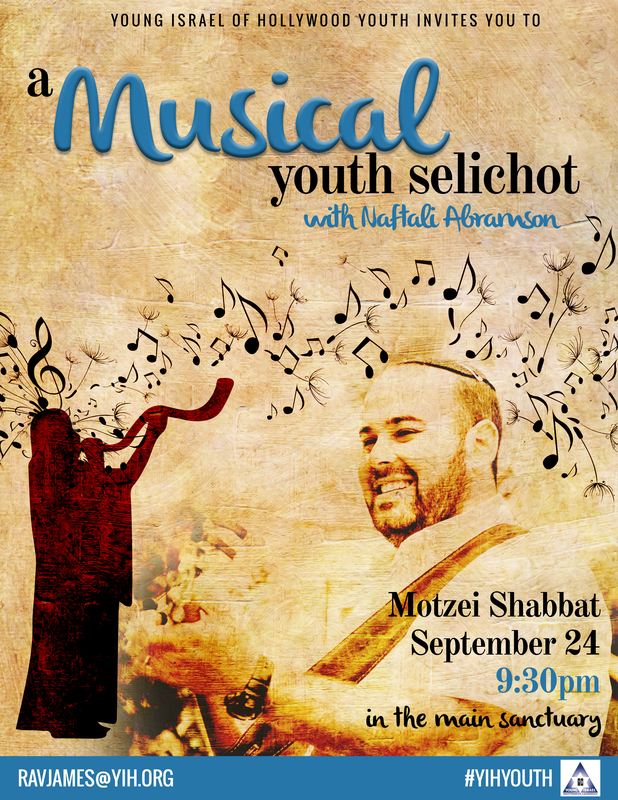 The details of this exciting program will be revealed at the Youth Minyan this Shabbat. Be there at 9:30am and you'll already be on your way to earning the biggest prize we've ever offered to Youth Minyan participants! This week's V'Shinantam PLUS will feature amazing surprise entertainment. There is a requested contribution of $10 per child to defray the cost of V’shinantam PLUS. PLUS: The long-awaited return of "Jump For Dollars" and a "Mizrach" Encore! It all starts at 7:00 PM. See you there! Thursday, December 4, 7:30pm: Hollywood NCSY Latte & Learn @ Dunkin Donuts for grades 9-12. Thurs, Dec 11, 7:30pm: Hollywood NCSY Latte & Learn @ Dunkin Donuts for grades 9-12. Saturday Night, December 13:Teen Panoply Challenge. Have you put together your team yet? Competition will be fierce. Click here to register! Thurs, Dec 18, 7:30pm: Hollywood NCSY Latte & Learn @ Dunkin Donuts for grades 9-12. Latke Night This Sunday... info you should know! Excitement is in the air... the 14th annual Bashevkin Latke Night is just around the corner. It all happens Sunday, December 7, 6:00 PM at Young Israel. You've got questions. This post has the answers! What prizes are being offered? Can middle school and high school students earn community service hours volunteering at Bashevkin Latke Night? Glad you asked! Bashevkin Latke Night is a YIH tradition for kids of all ages, introduced in 2001 by Youth Director Extraordinaire Amram Bendahan. The original Latke event was an evening of Chanukah-themed Bingo, with all sorts of incredible prizes. Everyone can play, regardless of age. Children don’t even need to be old enough to read to recognize the pictures on the Latke board. This year’s prizes include toys for kids of all ages, and electronics for everyone: Android tablets, Beats Studio headphones, a Sony PS4, a Bluetooth Karaoke Party Machine and more. There are also Amazon and Target gift cards, and other great prizes. Here's a picture we snapped after one of our Latke Night prize shopping trips. There's more where that came from! Yes. There will be pizza, donuts, popcorn, sno kones, and other yummy treats. All food is included in the cost of admission. Absolutely! We need volunteers to assist with check-in, serving food, giving out prizes, etc. At the end of the evening, all volunteers will be given a letter certifying their hours worked. All volunteers who arrive at 4:00 PM and get to work will be invited to play Latke at no charge. The cost of this event is $18 per player; $5 per adult non-player. Got more questions? Call Avi Frier at 954-483-3654. The Ciments live at 4141 N. 41st Street. See you there at 8:30 PM! Sunday, January 11, 5pm: Jr. NCSY Limousine Scavenger Hunt for grades 6-8. $25 per person if you reserve by Jan. 2; $30 after. January 15-23: Winter Break Adventures winter day camp program for kids in K-6. Click here for details. Join us this Friday night at 8:30 PM, at the home of Moshe Amar, 3860 N. 40th Avenue, for another great Oneg Shabbat exclusively for grades 6-8. In case you haven't heard, we recently announced a way that middle schoolers can earn a free trip to Universal Studios just for attending and assisting as a leader in the Youth Minyan. If you were not there for the big announcement, and have not been to the Youth Minyan since this program was announced, you can still join us and start with a clean slate. This "second chance" is only good if you join us during the month of December, so come on in and check it out! Every time you attend the Youth Minyan, you receive points. These points are given out a few times throughout Shabbat morning, so you benefit from arriving on time and staying until it ends. You can earn huge bonus points for assisting as a leader. There are opportunities for both boys and girls, including divrei Torah, announcing pages, and serving as Gabbai, baal koreh, and baal tefilah. We'll offer you plenty of ways to earn bonus points as we go. Everyone who scores an average of at least 9 points out of a possible 15 per week over the remainder of the year, will earn this free trip. If your friend is celebrating his bar mitzvah in the main shul, you will receive 10 points for attending the bar mitzvah and staying in the entire time; just let us know you were there and we'll make sure you get the credit. Questions? Ask Avi Frier or Rabbi Grossman. We're happy to help! We're gearing up for an amazing Winter Break, which starts in less than two weeks! Get in on the adventure... Register today! Winter Break Adventures is a winter break day camp program for kids in grades K-6. 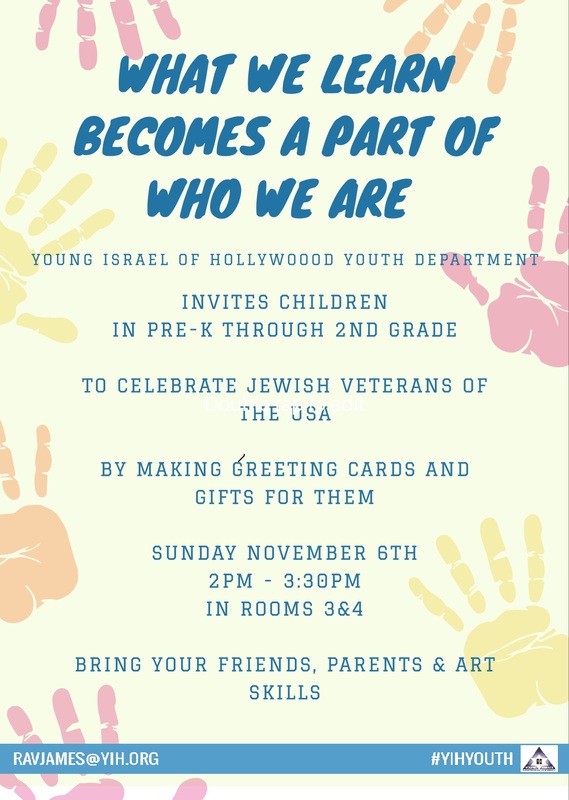 Offered by the Young Israel of Hollywood-Ft. Lauderdale Youth Department, under the direction of Avi Frier, Youth Director, and a hand-picked staff of counselors. Open to boys and girls in kindergarten through 6th grades. Drop-off at Young Israel of Hollywood each morning at 8:00 AM. Each day begins with age-appropriate tefilah; the rest of the day is divided into activity periods, including sports, arts & crafts, fun learning, entertainment, trips, and much more. All trips utilize county approved and inspected school buses with experienced, professional drivers. Snacks and drinks are provided to all participants free of charge; an optional lunch program is available for $8 per day. Questions? Call Avi Frier at 954-483-3654 or email avi@yihyouth.com. * Trip list and other program details are provided as examples only, and are subject to change without notice. Visit this page as WBA gets closer for our up-to-date program lineup. Winter Break Adventures starts in just 1 week! We're gearing up for an amazing Winter Break, which starts in just one week! Get in on the adventure... Register today! Please note: We have openings for 1 or 2 teens who would like to work as WBA counselors. Please reply if interested. Under "Payment is" select "for a donation"
Under "Type" select "Youth Purim Carnival Sponsorship"
That's it! Click here to get started. 8:30pm: NBA All Star Saturday Night on the big screen, upstairs at the shul. Pizza will be served. 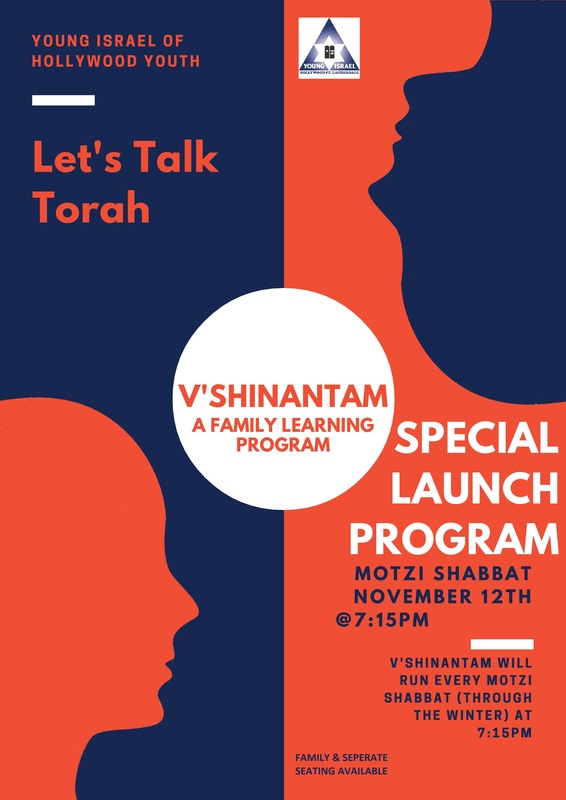 Join us for another great V'Shinantam learning program with Rabbi Grossman, plus an amazing surprise show! Sponsors are needed for this event. Please click here to donate online. There's a lot of useful Purim information in this post, especially for families with children. Print it out and use it as your Purim celebration guide! As in years past, our Purim celebration is dedicated in loving memory of Michael Zablotsky, the son of Charles and Lily Zablotsky, who was tragically taken from us at age 20, just days before Purim 5755/1995. A few days ago, the Zablotsky family observed Michael's 20th Yahrzeit. We are seeking sponsors for this event; this is the only time of year that the Youth Department does an open solicitation of funds. Sunday, March 1: The grassy lot surrounding the house across from the shul will be closed beginning at 6:00 AM for the Pre-Purim Carnival. If you park in that lot over Shabbat, please make sure you remove your car Saturday night or it may be blocked in until Sunday evening. Erev Purim, Wednesday, March 4: The paved parking lot on the south side of the shul (the Stirling Road side) will be closed beginning at 4:00 PM so that we can set up for the Mesibat Meir Purim Extravaganza after the evening Megillah reading. If you need community service hours, we need you! Join us at 10:00 AM on Sunday, March 1, and/or after Megillah reading on Wednesday night, March 4. TIA! Sno Kones, popcorn, music and more! There is no charge for the rides and food outside, thanks to the generous sponsors of Mesibat Meir. There is a charge for the Shuk Purim games in the social hall; Shuk Purim participants win prizes and proceeds benefit Bnei Akiva. Purim night, Wednesday, March 4: After the main shul Megillah Reading, join us in the parking lot for music, dancing, pizza, hamantashen, and a few surprises that will blow your mind! POW! Thanks to our generous sponsors, there is no charge for this event. Weather.com is predicting 5%-10% rain chance and 80° temperatures during the hours of Sunday's carnival, so the event will go on as scheduled with at least one water ride. See you there! If your car was parked over Shabbat on the property of the house across from the shul and you haven't moved it yet, please move it tonight or you might not be able to get it out until tomorrow evening. The house lot will be closed to all cars from midnight tonight until at least 4:00 PM tomorrow. Got Candy? Of course you do! 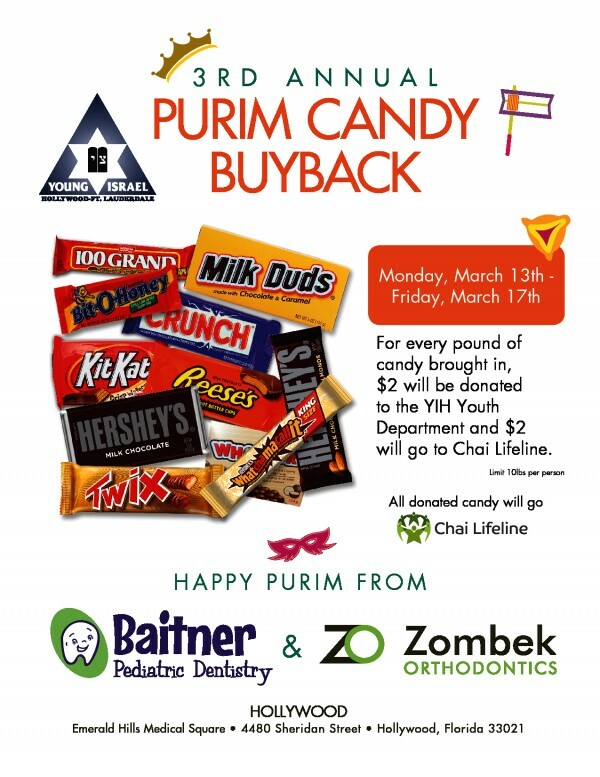 Bring your Purim candy to the Baitner/Zombek offices today (March 6), Sunday, March 8, or Tuesday, March 10, and they will donate $2 per pound to the Young Israel Youth Department! Visit Baitner Pediatric Dentistry and Zombek Orthodontics at the Emerald Hills Medical Square, 4480 Sheridan Street. The Youth Department thanks Drs. Baitner and Zombek for their support: not only their financial support of our activities, but their support of the health of our children! Now that we’ve changed the clocks, V’Shinantam L’Vanecha is on hold until November. But you don’t have to wait that long for some quality Torah learning time! Learning begins 45 minutes before Mincha; after Mincha the program continues with a delicious Seudah Shlishit featuring raffles and prizes. 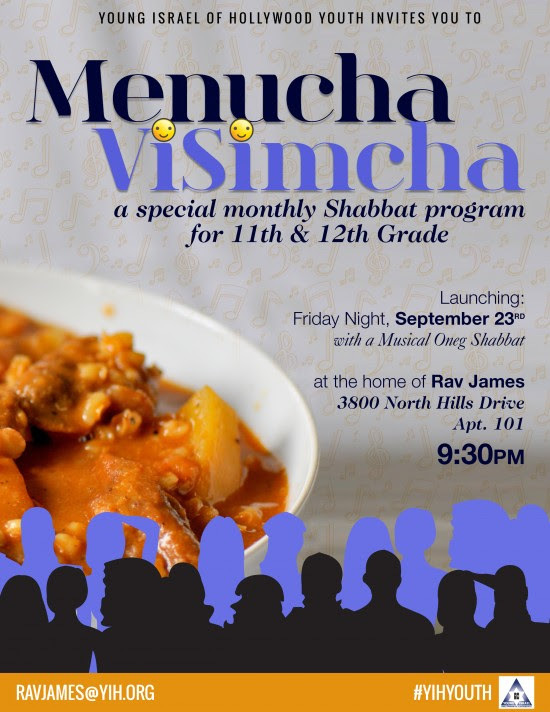 Everyone who attends at least seven out of ten Menuchat Emet programs will be treated to a Miami Marlins game with Rabbi Davis. The program will be led by Rabbi Grossman upstairs in rooms 1 & 2. Shabbat Shalom from YIH Youth! Just 4 YIH Teens: Beach Bonfire & more! YIH TEENS, join your friends from Hollywood and all over South Florida for an amazing Lag B'Omer Beach Bonfire at John U. Lloyd State Park. We'll provide Hot Dogs, marshmallows, and extra long skewers to roast your own! Take I-95 to Stirling Road. Head east on Stirling until it ends at Federal Highway. Turn left on Federal Highway, then turn right on Dania Beach Boulevard. Continue on Dania Beach Boulevard until the road loops around to A1A. At A1A, turn right into John U. Lloyd State Park. When you reach the entrance gate, the park will charge an entry fee of $6 per carload; $4 per car with no passengers other than the driver. People who plan to drop off NCSYers and pick them up later should hold onto the receipt for reentry into the park. After the entrance gate, continue 1.7 miles to the parking lot for the Manatee Pavilion (on right). Follow signs to the Manatee Pavilion Parking Area. After parking, follow the signs and tiki torches to the NCSY Lag B'Omer Bonfire. This coming Shabbat will be our annual Teen Minyan Takeover Shabbat at the 9:00 AM Minyan. PLUS: It's a Seersucker Shabbat (sponsored, of course, by the Baratz Family). Got Seersucker? Wear it with pride! YIH TEENS, join your friends from Hollywood and all over South Florida TONIGHT for an amazing Lag B'Omer Beach Bonfire at John U. Lloyd State Park. The park rangers at John U. Lloyd Park have recommended that we cancel tonight's bonfire due to inclement weather at the park. We will try again before the end of the school year. New date TBA. This Shabbat, May 30, YIH kids in K-5th grades are invited for a luncheon after shul, followed by a fun activity. Pickup at the shul will be at 2:30 PM. Cost: $15 per person in advance; $20 without prior reservation. We still need a few teen group leaders to help. Reply to this email if interested. Scroll down for info on these three events. We need teen volunteers for all of these. If you still need community service hours for school, this is a great way to take care of the requirements before the summer! Reply to this email and let us know when you want to work. Please note: Dinner will not be served; for this reason, the start time has been pushed one hour earlier than originally announced. The Bash will begin at 4:00 PM. YIH Youth Year-End Bash TODAY - something fun for all ages! Tonight is our last YIH Teen Oneg Shabbat of the year. Come get together with your friends one last time before the summer, and send off our HS graduates. It all happens at 9:30 PM at the home of Dani Ditchek, 5910 SW 33rd Avenue. Photos are online from two amazing kickoff events. The Youth Department is looking to improve and build upon the current programming offered for Middle School students. As you know, this is an important transition period for children as they become bar and bat mitzvah and prepare for high school. At this point in their lives, it is crucial that they become engaged in their Shul and Jewish community, and we recognize that it would be impossible for us to make this happen without your input, support, and (most importantly) your encouragement of your middle school student to be a part of it. Please join us at a meeting for Middle School parents so that we can share with you what we are working on, and so that you can offer suggestions and share any concerns you may have. The meeting will be held Thursday, September 11th after Maariv (approx 8:00 p.m.), upstairs at the Shul. Please let us know you'll be there by replying to this e-mail. 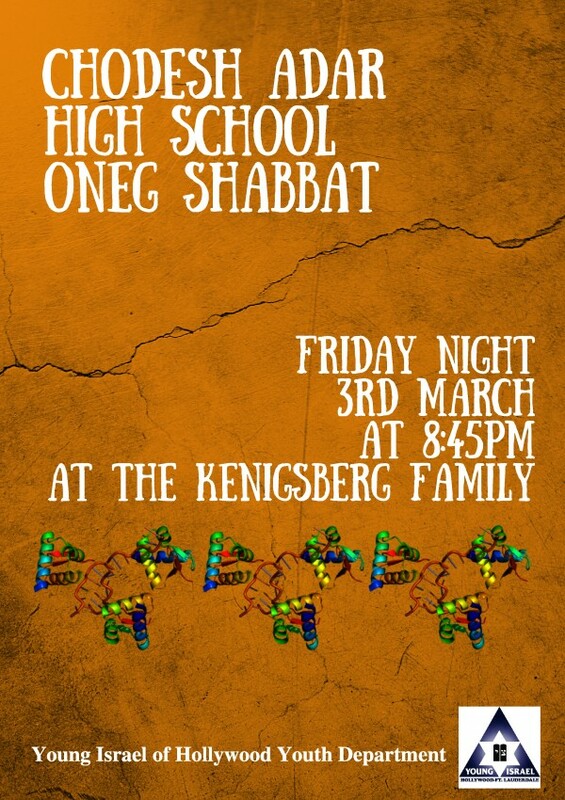 THIS FRIDAY NIGHT, 9:30-10:45 PM: Oneg Shabbat for grades 6-8 at the Stauber home, 4191 park View Drive. 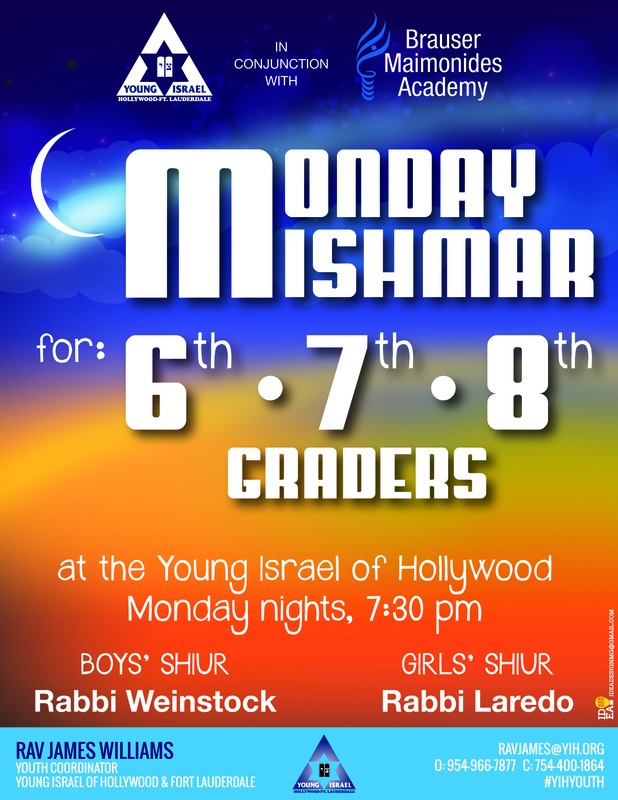 Under the leadership of Rabbi Grossman, the Youth Minyan continues this week at 9:30 AM as in the past. We apologize for any confusion that may have been created by an incorrect listing in the Shabbat Announcements. For more information on our Shabbat morning activities, please click here. Join us after Mincha in the social hall for the annual Bnei Akiva Meet & Greet Seudah Shlishit. Click here for the flyer containing full details about this event. Kids in grades K-5: Join us at the shul for a fun morning of bouncing, sliding, jousting, and climbing! Of course, there will also be popcorn, Sno-Kones, music, prizes, and other fun stuff! 6th-8th Graders: Join us in the back yard of Phil & Lisa Baratz for BBQ, basketball contests, ping pong, root beer pong, foozball, prizes, and music. PLUS: Help Rabbi Grossman accept the ice bucket challenge! Shemini Atzeret, Thurs Oct 16, 4pm: Mini Hakafot for the mini ones. NCSY is going to Sky Zone tonight for Midnight Madness IV. Registration required. Click here to register online.